Today’s dressgasm is epic by my standards. 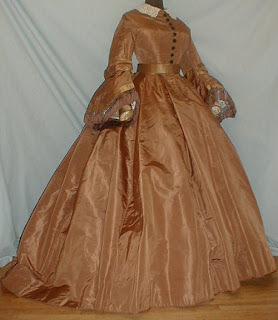 To the untrained eye, it looks like a typical visiting dress from the Civil War period but there are some very unique design elements that I find fascinating. 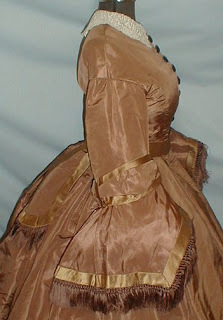 This dress is a two-piece silk visiting dress (we discussed the purpose of visiting dresses in an earlier dressgasm blog) and a two-piece dress is the bodice and then the skirt with the waistband attached. Sometimes two-piece dresses were held together like a pseudo-one-piece with hooks and eyes at the waist. This woman had a 24-inch waist and I believe the dress length from collar to hem was something like 41 inches. Copper, bronze and brown were extremely fashionable colors in the mid-nineteenth century so this dress was the height of fashion. What makes this dress so unique to me is the sleeves. I would term it as modified pagoda. Normally pagoda sleeves are bell-shaped and start at the elbow but it appears that these sleeves start fanning out at three-quarter length. Not only that but the embellishments are of unique design as well. It looks like there are satin ribbon bands around the arm and then around the edges with silk fringe. If you look in the picture above, it appears that there are attached undersleeves of the same copper silk material. That is very unique. I can’t think of another example of a design like that and my images of antique clothing number in the thousands. Under normal circumstances, the undersleeves would not be attached and they would be white like the collar. Undersleeves were removable for washing and were worn to protect the dresses from bodily oils and dirt, as these dresses were not easily or often washed.